Giving is an art perfected by some of the world’s wealthiest individuals who felt a moral responsibility to share their wealth to ease the pains rampant in society. But philanthropy works better when people and organizations come on the same page and contribute to the betterment of the society. Back in 2010, Bill and Melinda Gates and Warren Buffett, created, “The Giving Pledge,’ an effort to help address society’s most pressing problems by inviting the world’s wealthiest individuals and families to commit to giving more than half of their wealth to philanthropy or charitable causes either during their lifetime or in their will. Men like Shiv Nadar has created a benchmark for others to follow in this noble cause. Clearly very individual or an organization has these ‘giving tipping points’ and they embark on well meshed CSR programs. Let’s look at some of the tech companies and their CSR activities. Other philanthropic stalwarts like Narayana Murthy, Azim Premji, Nandan Nilekani and host of others have shared a significant amount of wealth and time to philanthropy and kick-started various CSR initiatives. When it comes to philanthropy, and CSR the real test is when the rubber meets the road. An organization needs to take the things at ground zero and ink a beneficiary plan that makes a real sense of fulfillment. 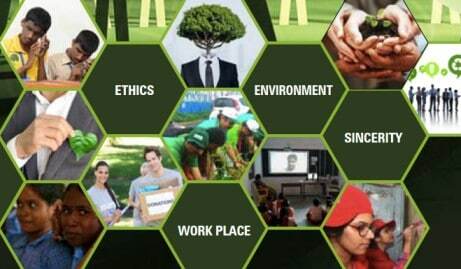 Let’s look at what some of the leading IT companies are doing in the CSR space. 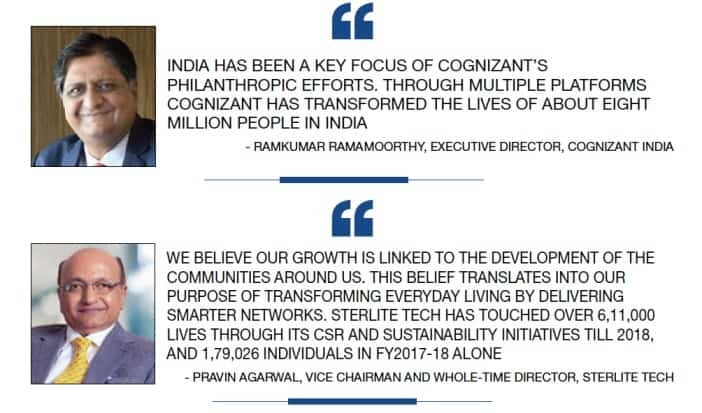 Launched in 2005 as an independent corporate entity, Cognizant Foundation spearheads corporate social responsibility initiatives of Cognizant in India and has touched the lives of over three million people. The primary objective of the Foundation is to improve the lives and opportunities of economically and socially disadvantaged sections of society in India through programs centered around education, healthcare, and livelihood. “Under our Samaritans program, we visit orphanages, spend time at old age homes, and volunteer time with municipal school children and participate in games and awareness sessions. We organize and participate in cleanliness drives and spread awareness on waste management and motivate disabled students, and help community members understand the need for skill building. 924 LTTS employees have turned Samaritans dedicating over 3,400 hours, impacting over 7,483 beneficiaries, “ adds Dr.Panda. “Our CSR efforts are designed to ensure holistic development of communities while ensuring that our core capabilities in broadband technologies are leveraged to enable holistic community development process. This approach encourages employee and community participation and promotes strategic partnerships in various social endeavors, “ adds Agarwal. Through its ‘Digital Inclusion’ initiatives, appx. 700,000 youth and citizens were trained under digital skills and STEM Education say sources at SAP India. 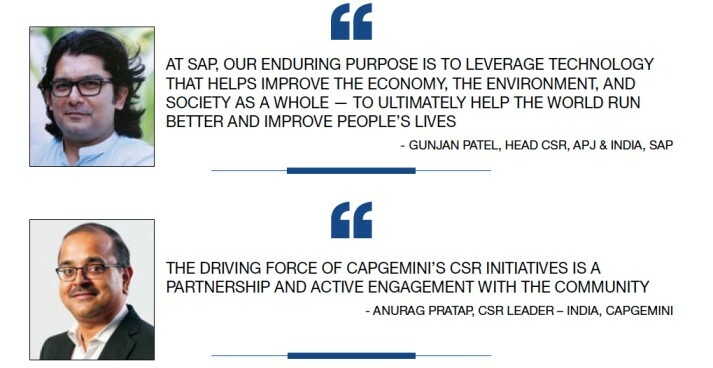 Anurag Pratap, CSR Leader – India, Capgemini says, “The driving force of Capgemini’s CSR initiatives is a partnership and active engagement with the community. Capgemini believes that together, we can create and deliver sustainable solutions that would also support the community’s needs as well as help its members towards greater inclusion and strengthen their capacities to articulate their aspirations. “Our efforts are to rejuvenate 137 government schools with the facilities to enable children to enjoy learning in smart classrooms that is Wi-Fi enabled. We have set-up virtual classrooms for students preparing for engineering entrance, a virtual resource center on sustainable education and 28 skilling center on digital and future skills as part of our CSR interventions. With these initiatives we are reaching out to more than 8.5 lakhs community members,” adds Pratap. Clearly, it’s a multipronged approach the companies are taking and they are taking education and entrepreneurship as a CSR focus area in a big way. “ Anticipating and preparing for the impact of digital technologies on the workforce is an urgent issue. Our corporate citizenship initiative, Skills to Succeed, advances employment and entrepreneurship opportunities for individuals around the globe. We are leveraging digital innovation to drive impact at scale and help close skills and employment gaps for vulnerable and marginalized people around the world,” says Kshitija Krishnaswamy, associate director and lead, CSR, at Accenture India. “In India, we are focused on providing skills to help disadvantaged people get jobs and start businesses, and under ‘Skills to Succeed’ we’ve collaborated with strategic non-profit organizations and used digital technologies to deliver impact at scale. So far, we’ve enabled more than 380,000 people including women and people with disabilities, to earn livelihoods for themselves, and create employment for others, “ says Krishnaswamy. 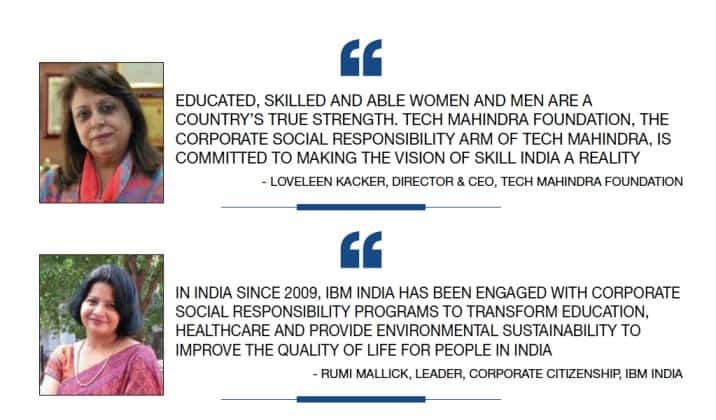 Rumi Mallick, Leader, Corporate Citizenship, IBM India says, “In India since 2009, IBM India has been engaged with Corporate Social Responsibility programs to transform education, healthcare and provide environmental sustainability to improve the quality of life for people in India. Keeping the focus on education, public health, and resilience, IBM has worked with over 250 social organisations, across 20 states in India, who in turn impacts millions of underserved school children, teachers, youth, and NGOs working with women, farmers and livelihood seekers, and under-served communities, while supporting Government initiatives such as Rashtriya Madhyamik Shiksha Abhiyan, Digital India and Skilling India. In education, IBM CSR’s overarching core areas are systemic reforms in school education especially STEM education and teacher professional development, and ‘New-Collar’ jobs. Driven by national priorities, IBM CSR has focused on improving STEM Learning in schools, working closely with the Ministry of Human Resource development and state government through its partner NGOs. As we look at the road ahead for CSR, one can see the escalation of the CSR activities in this part of the world. The CSR landscape received a fillip, when the Indian government made an amendment to Company Act 2013 and made CSR mandatory and a portion of profits must be invested in CSR areas like Education, Poverty alleviation et al. 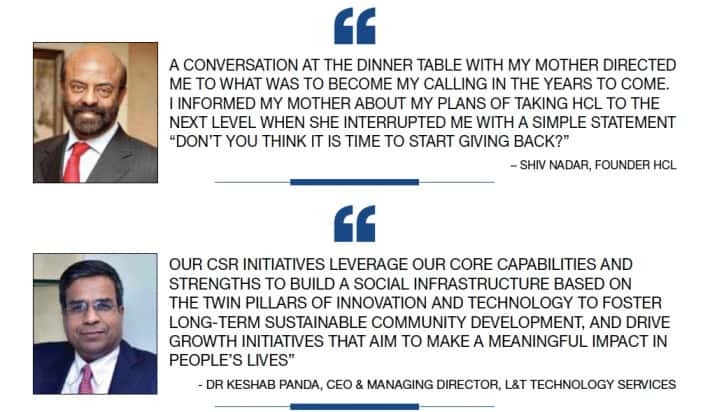 The IT companies in their fray are also doing their bit and indulging in a range of CSR initiatives and has ushered in definite societal change. Beyond Business- A Look At Tech Companies And Their CSR Activities 0 out of 5 based on 0 ratings. 0 user reviews.